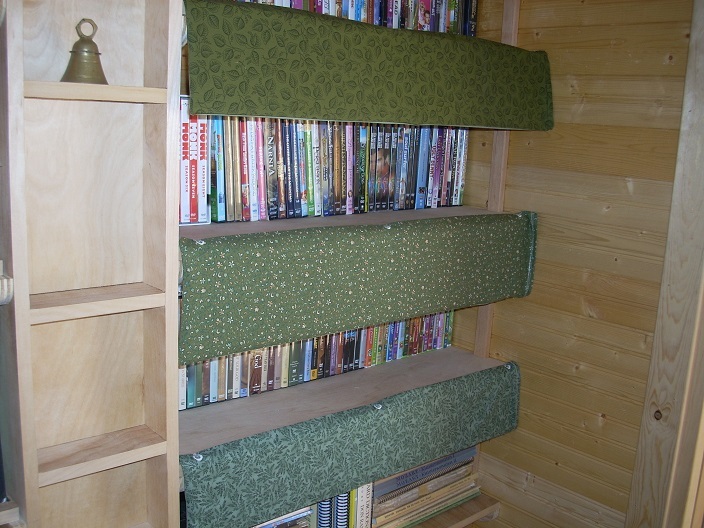 These bookshelf dust shields are a piece of cardboard in a fabric pocket, hung by three tiny Command decorating clips. The cardboard adds stiffness and gives a wrinkle-free look; it is removable so the cover can be washed. Gives a beautiful, clean look to ‘ragged’ tops of books and protects them from dust. Cut up boxes from your Amazon purchases (or wherever) for the cardboard. All units are inches. For example, $\,h = 5.5\,$ denotes that $\,h\,$ is 5.5 inches. Measure the width of the bookshelf ($\,w\,$), from inside left edge to inside right edge. Use a height ($\,h\,$) that covers all the ‘ragged’ book tops (due to books with different heights). I often use $\,h = 5.5\,$ or $\,h = 6.5\,$. Cut two identical-size pieces of fabric; width and length are given below. You can use the same fabric for both: or, cut the front from one material, and the back from another. WIDTH: 1.75" longer than your piece of cardboard (i.e., $\,w + 1.75\,$). This allows for one side seam and the finished opening. HEIGHT: 2.5" more than your piece of cardboard (i.e., $\,h + 2.5\,$). This allows for a top and bottom seam, one inch extra at the top (where the buttonholes to hang on the command clips go), and a little extra for ease of cardboard insertion. Put fabric pieces right sides together. Sew 5/8" top and bottom seams. Then, sew a 5/8" left seam. Fold over and sew 3/8" on right edge, then fold and zig-zag 5/8" again. This gives a finished edge for the opening where the cardboard is inserted (which is the right edge of the shelf). Trim corners on left edge, if desired. Turn right-side out, pushing corners out with (say) the eraser end of a pencil. Press (iron). Hold the fabric up to the shelf and mark the positions for the three holes. I use a flower stitch attachment to get a circular hole, but you can also use a small regular buttonhole. The opening of the hole should be one-half inch from the top edge of the fabric. Insert the cardboard and hang! Use embroidery machine to make name tags. Be sure to use stabilizer sheet. If your fabric is thin, then do NOT remove the stabilizer sheet, because it adds stiffness to the label. Trim with a 1.5" inch margin on all sides. Press a 1/4" seam, from right-to-wrong side, on long edges. Press a 1/2" seam, from right-to-wrong side, on short edges. With wrong sides together, sew as close as possible to edge on longest edge. Press again, with writing centered (seam should be centered in back). Attach with velcro to dust shield.